Specifically designed for electrical and industrial trade customers, Carl Kammerling International has launched its 2018 Fusebox Promotion. This year, the trade promotion will run for a longer period, from February 1 to June 29, 2018. Fusebox also provides customers with an incremental profit opportunity and high margins, with up to 65% discounts (35% for Ireland). A collection of 75 quality products are on offer in Fusebox 2018, including proven sellers, a selection of new product launches, six range deals, together with a wide choice of high visibility merchandising solutions. 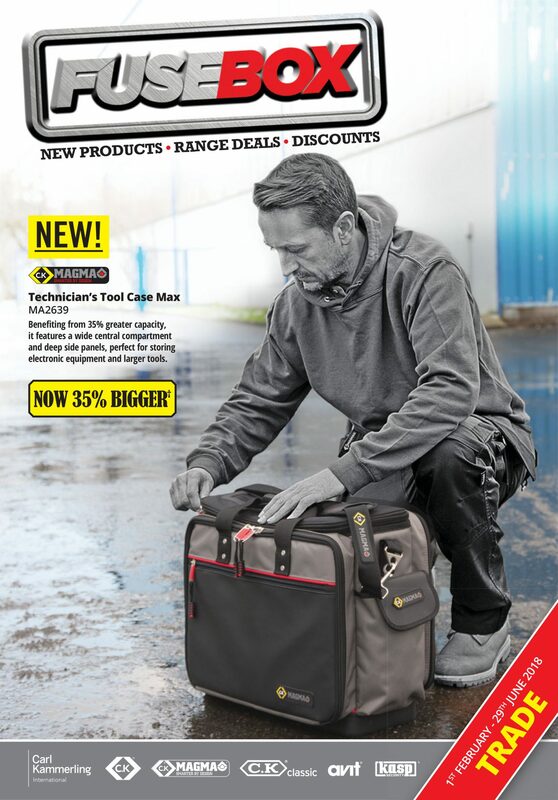 the new C.K Magma technician’s tool case max, which offers 35% greater capacity, a wide central compartment and deep side panels, designed to be an all-in-one portable storage solution for electronic equipment and larger tools. Push button waterpump pliers, available in three sizes (175mm, 250mm and 300mm). the C.K Stubby VDE slim screwdrivers (set of four) for use in confined spaces, designed with slim shafted insulated blades to allow access to recessed screws and fixings. the C.K Mighty Rods PRO cable socks (in two sizes: 6-10mm and 11-15mm), feature woven steel wire mesh for exceptional strength and grip. the C.K Stubby VDE slim screwdrivers display, featuring a robust counter display of the Stubby VDE slim screwdrivers, designed to create product stand out at point of sale. the newly designed C.K Mighty Rods display, including a collection of cable rods, PRO cable socks and a Mighty Rods carry case. Fusebox 2018 promotional materials are also available, including a professional double-sided counter mat, with high impact photography for added stand out, and for the first time, yellow price stickers will be supplied with any Fusebox orders to assist with sell out. The Fusebox trade brochure showcases all the new products and range deals, an overview of the key benefits of the promotion, plus a feature page highlighting the new Carl Kammerling display backing board (1M), designed to help customers drive impulse sales. For the first time, CKI has created a dedicated web page, providing a quick overview and easy download catalogue, which can be accessed on its website.